Aluminum scrap is thermally pretreated to clean or remove "contaminants" (i.e. ; rubber, oils, paint, plastics, water, and metals) from the aluminum prior to the aluminum being re-melted. Depending on the processes utilized, natural gas consumption will range from 1.0 to 1.3 Mcf per ton. Scrap is crushed to uniform size and heated in rotary dryers to temperatures high enough to vaporize organic materials but not high enough to melt aluminum. After roasting (at temperatures less than 850°F), scrap pieces are subjected to magnetic separation to remove any ferrous material. Beverage containers are a major portion of recycled aluminum and are usually covered in lacquers and sealers. To minimize metal loss and increase efficiency during melting, these lacquers and sealers are removed at temperatures typically around 925°F. Aluminum scrap containing metals are heated in a sweat furnace to temperatures above the melting temperature of aluminum, but lower than the melting point of the other metals. The molten aluminum melts and trickles (or "sweats") down into collecting pots, leaving the higher temperature melt materials in the furnace. 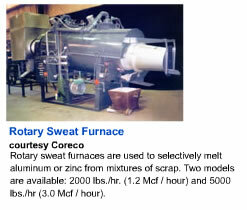 This process is used for high iron content scrap in order to minimize the iron that enters a molten aluminum bath.